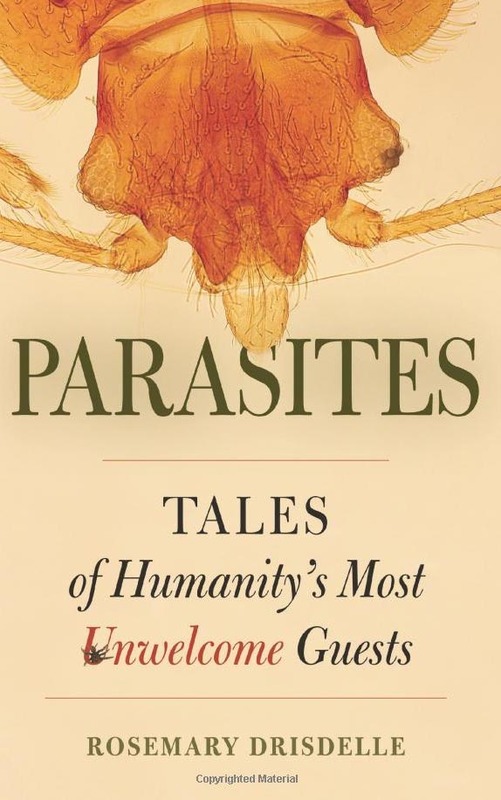 "Parasites don't just make hosts sick; they are an important part of life on earth." Does Toxoplasma gondii Cause Prostate Cancer? Cats are making headlines again, courtesy of Toxoplasma gondii, that tiny protozoan that infects warm blooded vertebrates far and wide, but especially, most especially, cats. The latest news flash is that T. gondii may cause prostate cancer. Of course some headlines go one step farther and blame the cats. More on that later. 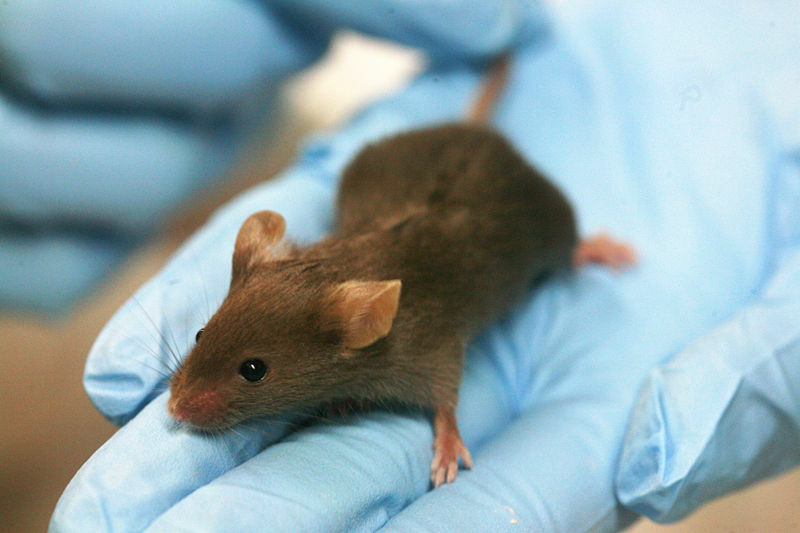 A study reported in the journal Prostate found that mice inoculated with T. gondii in the lab developed prostatic inflammation that persisted and progressed (Colinot et al). Two weeks after the mice were infected, cysts of T. gondii could be found in the prostatic tissue. The aim of the study, however, was not to determine whether mice infected with T. gondii develop prostate cancer, but to determine whether T. gondii causes inflammation and hyperplasia (enlargement of the prostate) in mice. Inflammation and hyperplasia are both benign. 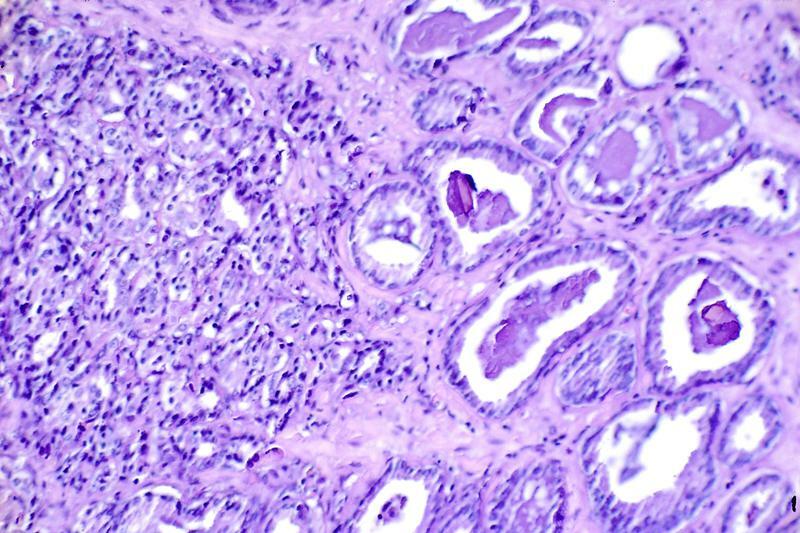 Inflammation in the prostate is associated with development of prostate cancer, though the relationship is not well understood. The authors remark that their work has provided “a powerful new mouse model for the study of chronic prostatic inflammation and microglandular hyperplasia” (my emphasis). They don’t claim to have found a cause for prostate cancer. Further work reported in the Journal of Urology found that men with antibodies to T. gondii (indicating infection) are about five times more likely to have an elevated PSA (prostate specific antigen) level than men who have not been infected. High PSA results also correlate with prostate cancer; however, the test has a high false positive rate, and also correlates with benign prostate conditions. I’ve noticed that when I pull a dandelion out of my lawn, there’s usually an earthworm entangled in the roots. Does that mean earthworms come from dandelions? No. A number of articles reporting on the study in question have used the faulty logic that prostate cancer is associated with inflammation and hyperplasia, and T. gondii causes inflammation and hyperplasia, therefore T. gondii causes prostate cancer. Some have gone farther: T. gondii is a parasite of cats, therefore cats cause prostate cancer. 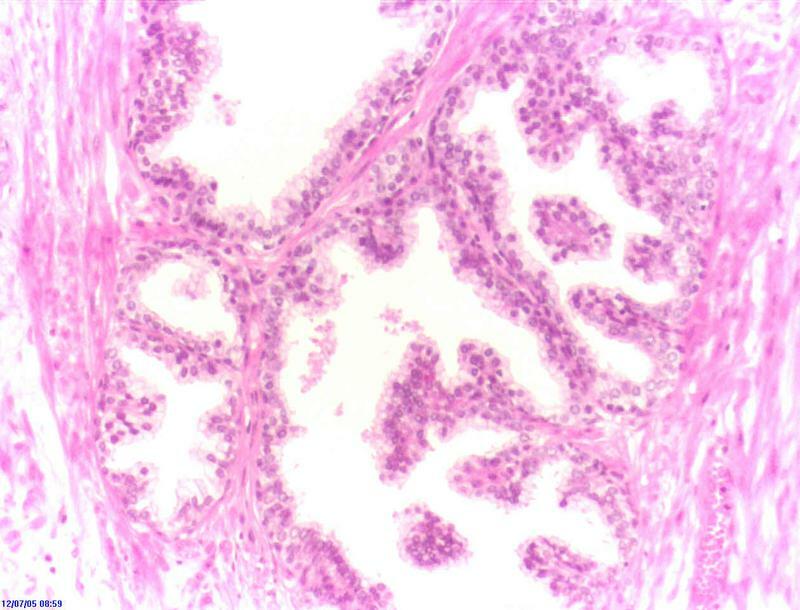 It may turn out that T. gondii plays a role in the development of some prostate cancers (or it may not), however getting rid of the family kitty as a preventative measure would be not only premature, but also pointless. Many people acquire toxoplasmosis from other sources: undercooked meat, contaminated soil or water, from an infected mother prior to birth. Do We Find Toxoplasma gondii in Human Prostate Tissue? Finally, if T. gondii is a common cause of prostate cancer, one would expect to see a correlation between the incidence of prostate cancer and the incidence of T. gondii infection in various countries around the world. This one’s tricky because most data for prostate cancer comes from older men, while most data on T. gondii infection comes from pregnant women. It would be an interesting thing to look at however. Meanwhile, let’s wait for research to give us more answers, and give the cats a break. Colinot DL, Garbuz T, Bosland MC, Sullivan WJ Jr, Arrizabalaga G, Jerde TJ. 2017 “Toxoplasma gondii Infects the Prostate and Induces Microglandular Hyperplasia in a Mouse Model of Prostatic Hyperplasia.” Journal of Urology 197, No. 4S Supplement, May 12. 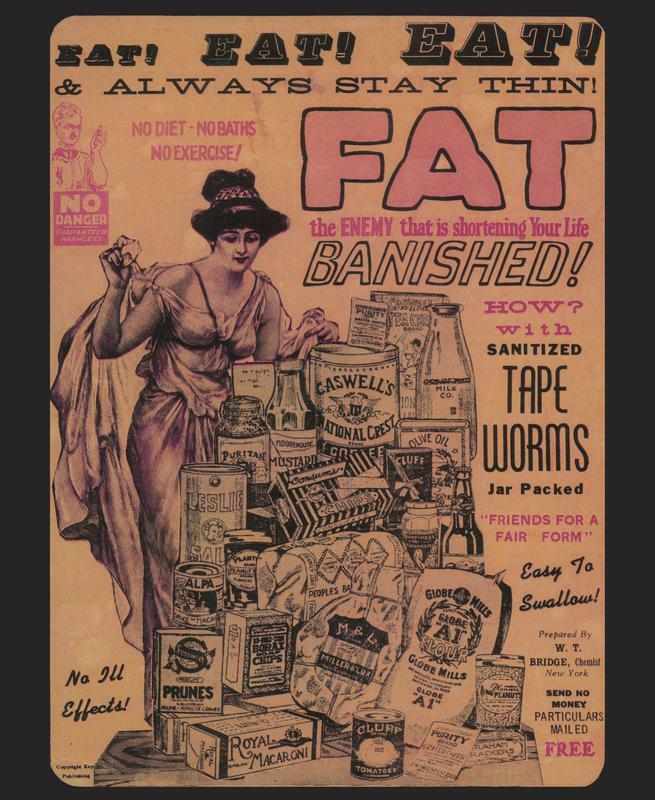 When someone reports a case of worms, Ascaris is the one most of us think of: disconcertingly large, classically wormy, and hosted by more than a billion human beings. It's the only large roundworm to inhabit the human intestine and this is its natural history. Ascaris lumbricoides is also known as the large or giant intestinal roundworm of humans. 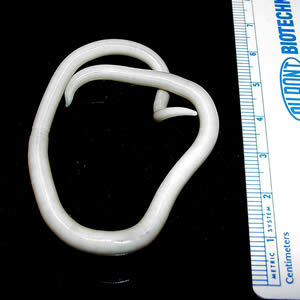 Larger than the average earthworm when adult, this is the only large roundworm to inhabit the human intestine. You become a host to this parasite after swallowing infective eggs. There's no way to know you're swallowing them: they're about six one- hundredths of a millimeter long. You could place five of them end to end on a single grain of table salt. - Eggs are found in warm moist soil where other infected humans have defecated. They are swallowed on unwashed fruits and vegetables, transferred to the mouth on soiled hands, even swallowed in untreated, unfiltered water that has washed off contaminated soils. In some cases, they may be inhaled. - Eggs pass through the stomach unharmed and arrive in the duodenum, the first section of the small intestine. Worm larvae, which have lain quiet inside the eggs, emerge. - Larvae burrow through the intestinal lining into the tissue underneath and continue on until they push through blood vessel walls and are carried away in the bloodstream. - Larvae travel through the liver and heart, eventually arriving in the lungs, where they break out into the airspace. - In the lungs, the larvae grow, passing through several stages of development. By the time they are ready to leave the lung, about nine days have passed since the eggs were swallowed. 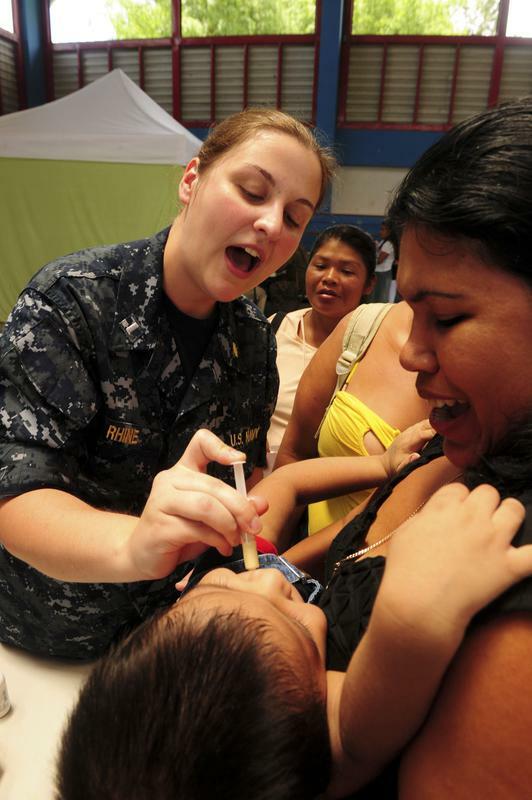 - Larvae travel up the airways or are coughed up. Those that are subsequently swallowed survive their second trip through the stomach only if they are sufficiently mature to withstand the acid conditions there. - Larvae remain in the small intestine and continue to mature. Females will eventually grow to 45cm in length (males are smaller). - Sexually mature females begin producing eggs that are mixed with intestinal contents and passed in the stool. 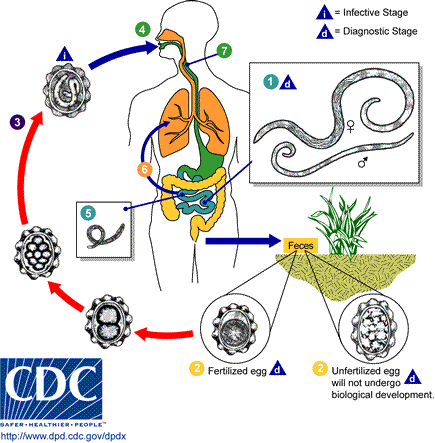 - When an infected human defecates outside, eggs are introduced into the soil. In warm moist conditions the eggs will be infective to another person in a couple of weeks. When conditions are cold, dry, or otherwise hostile, eggs can remain dormant for long periods of time, then mature when the environment is more favorable. One thing that works in our favor is that you can't catch Ascaris lumbricoides directly from another infected human, even if that person is careless with hand washing: the eggs are immature when passed and require time in the environment to become infective. It's bad luck, however, that the eggs will survive and remain infective in soil for a decade or more under the right conditions; once an area is contaminated, it's almost impossible to eradicate the parasite. These two features of the worm's life cycle explain why the parasite remains common in tropical and subtropical areas of the world where the climate is warm, and sanitation is often poor. Ascaris lumbricoides is virtually exclusively a human parasite, meaning that it does not infect dogs, cats, or other domestic animals, with the possible exception of pigs. The large intestinal roundworm of pigs, Ascaris suum, is very similar to Ascaris lumbricoides and there is considerable evidence that A. suum occasionally infects humans and the human species may well infect pigs. The whole process from swallowing the egg to having mature worms in the intestine takes between two and three months. The worms live, on average, a year or two and a female can produce up to six million eggs in her lifetime. No wonder this is one of the most common intestinal worms of humans. Outbreak News Today interviewed me for a podcast about Ascaris lumbricoides. Many protozoan parasites have a hardy stage that survives for long periods in soil and water. Others naturally thrive and multiply in the environment. 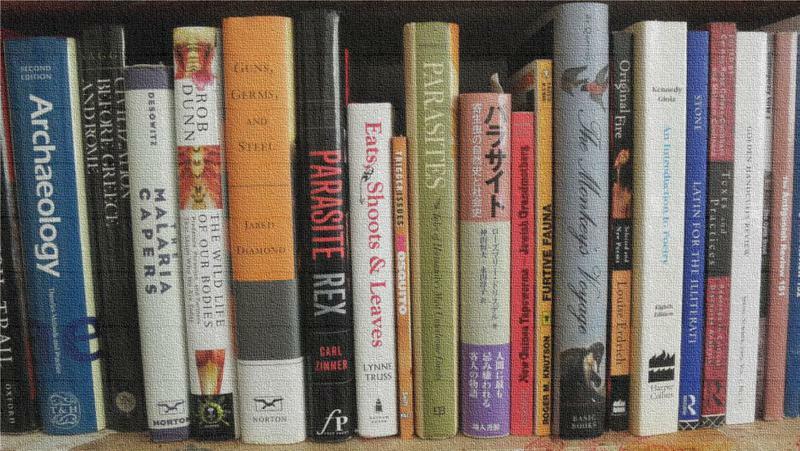 Most people have heard the common wisdom that you can catch worms from eating dirt—it’s true that a number of parasitic worms infect humans through accidental ingestion of contaminated soil—and these are not the only parasites that may be present. Protozoan parasites, tiny single celled organisms, can remain alive and infective for long periods in soil. This doesn't mean, however, that all soil contains them. How do Protozoan Parasites Get Into Soil? Healthy soil is full of organisms: bacteria, fungi, insects and their larvae, nematodes, amoebae, flagellates, ciliates and more. These organisms are involved in the breakdown of organic matter, the nitrogen cycle, the weathering of rock etc. Most of them are harmless to us and essential to the environment. Intestinal protozoan parasites are passed in feces. When an infected human or animal defecates on the ground, millions of parasites contaminate soil. Many protozoan parasites have a tough cyst stage—a stage that isn’t actively growing or multiplying, but which can survive and remain infective in the environment until it can infect a new host. A few of the protozoan parasites that infect humans are actually environmental species—species that normally live in soil or water and only accidentally cause disease. 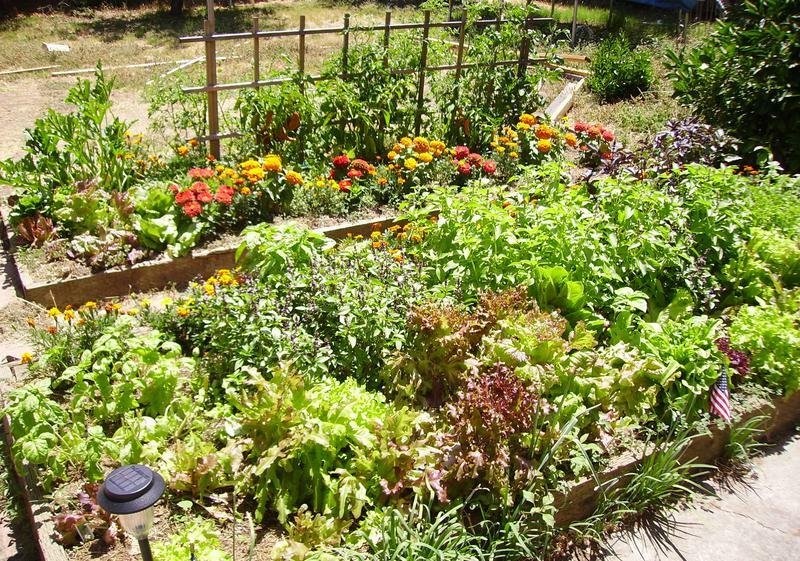 We don’t think we’re eating dirt but, actually, we all eat more than we realize. Not only do we often put dirty fingers and objects in our mouths (children are particularly likely to do this), but we eat particles of dirt on raw fruit and vegetables. Tiny protozoan cysts, 5 to 100 one-thousandths of a millimetre wide, are invisible to us—there might be hundreds of them on one dirty finger. While many protozoans are better known for spreading via dirty water, not everyone does, or can, use a flush toilet, human excrement is sometimes used as fertilizer, and dirty water is used to water crops. Animal feces, too, can contain organisms infectious to humans—soil can certainly be a source of infection. Amoebae: The most common of the intestinal amoebae that cause disease is Entamoeba histolytica, the agent of amoebic dysentery. This dangerous parasite not only causes severe diarrhea but can cause abscesses in the intestine, liver, and other organs. Best known for contaminating water supplies, E. histolytica can easily contaminate food crops as well. An environmental amoeba, Acanthamoeba spp., which is usually found in water, decaying organic matter, soil, and sewage, is of particular interest to contact lens wearers—unfortunately, it’s capable of multiplying in a human eye cornea and causing vision- destroying infection. 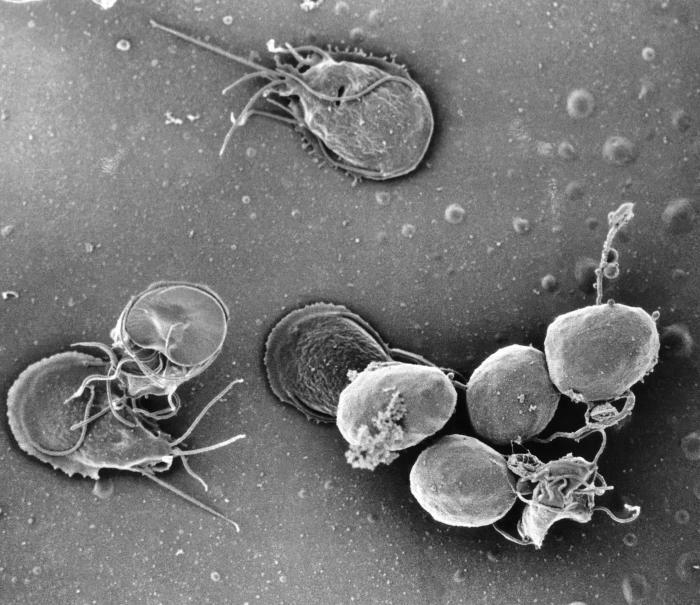 Flagellates: Found in surface waters all over the earth and spread in the feces of both humans and animals, Giardia lamblia is the most infamous of the intestinal flagellates that cause disease. 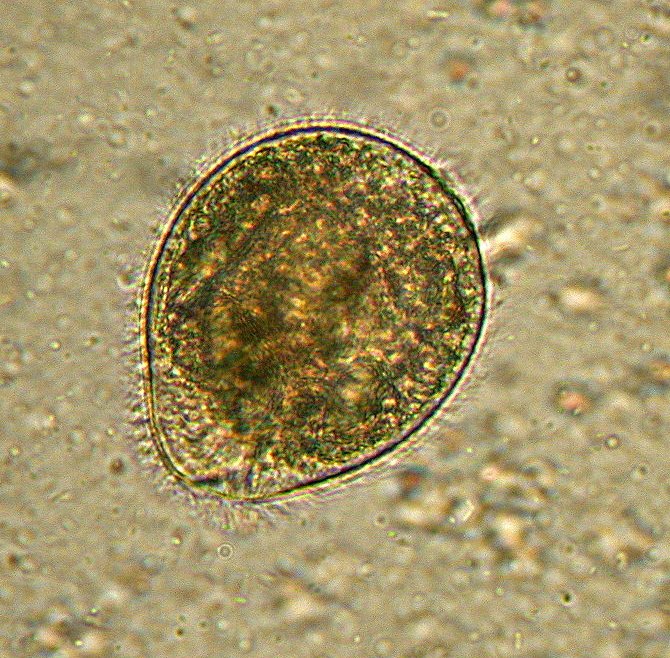 Ciliates: Only one ciliate parasitizes humans. It’s Balantidium coli, a large protozoan associated with pigs. Contact with pig feces, or soil contaminated with pig feces spreads this parasite that can cause severe diarrhea and intestinal abscesses. Coccidia: A number of coccidia cause parasitic disease in humans. 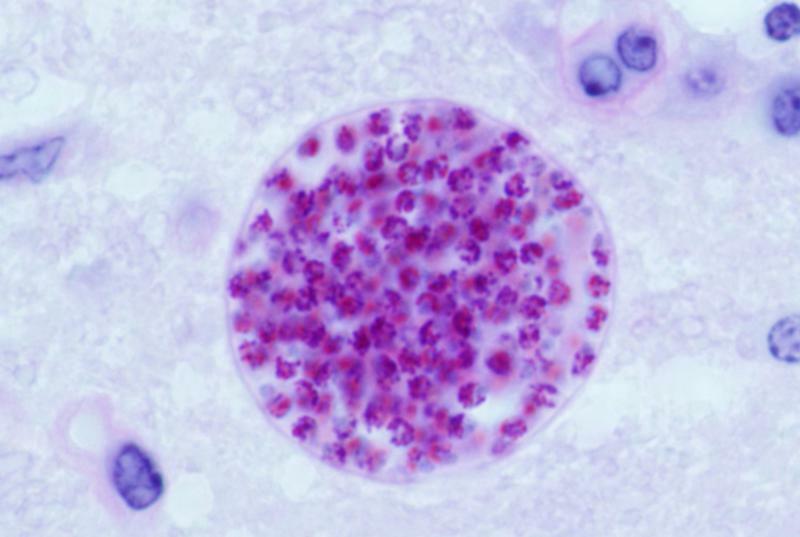 Toxoplasma gondii contaminates the soil world wide and can infect all warm blooded vertebrates. Cyclospora cayetanensis has been associated with contaminated fruits and vegetables, and Cryptosporidium parvum is found in surface waters everywhere. Keep dirty fingers away from your mouth. Wash your hands thoroughly before handling food or eating. In areas where sanitation is not good, avoid eating uncooked fruits and vegetables that you have not washed and peeled yourself. Do not drink untreated water. Balantidium coli is the only ciliate to parasitize the human intestine. This trophozoite has delicate cilia like peach fuzz all over it's outside. 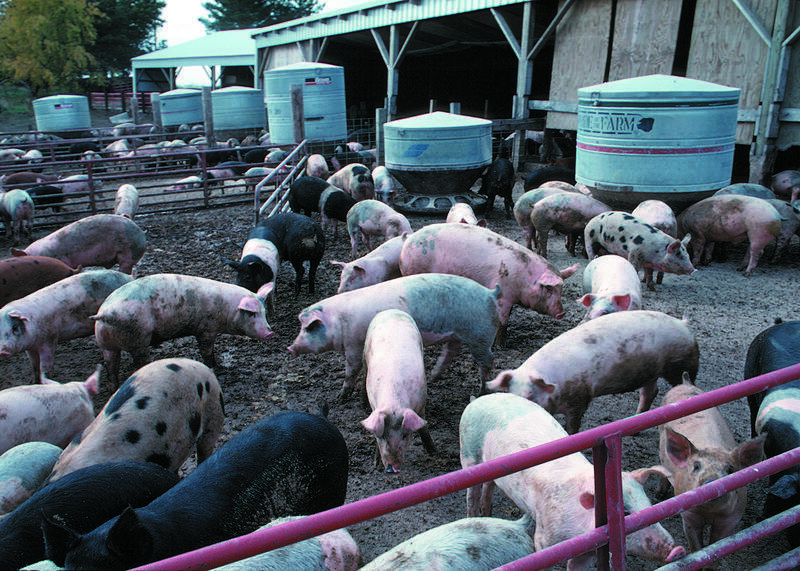 Feedlots produce a lot of animal waste. Sometimes it is used to fertilize crops and may contaminate soil, and fresh produce, with harmful organisms. Photo by Lynn Betts, USDA Natural Resources Conservation Service.